Big changes are in store as the series comes to a close, but some things never change. The end is nigh for "House of Cards," as the final season of the Netflix hit is just weeks away. But before fans say goodbye to the scandal and intrigue, they can say hello to a sneak peek at what's come. A new one-minute tease offers a glimpse of where the plot is headed, and although a lot has changed on the White House thriller — like the commander-in-chief — much has stayed the same. 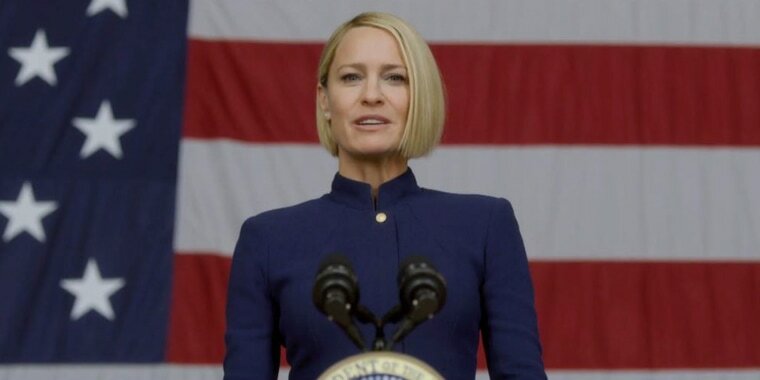 "My first 100 days as president have been ... difficult," the current President Underwood, Claire (played by Robin Wright), tells the nation in the clip. And it's clear that those difficulties, as well as the dishonor and dirty deals the show is known for, aren't going away any time soon. But, of course, one of the show's primary characters has gone away. The last season of the political drama will be the first without former leading man Kevin Spacey (aka Francis "Frank" Underwood), who was written out of the story in the wake of sexual assault allegations against the star last year. Fans recently already learned Frank's fate, thanks to a previous preview of his tombstone, but the new video reveals that neither his widow nor the nation are really in mourning. "Here's the thing," Claire continued in the address, "Whatever Francis told you the last five years, don't believe a word of it." Cue the cheers from the crowd, as well as a voice-over from her declaring that "the reign of the middle-aged white man is over." That doesn't mean her reign is safe. New faces and probable foils (played by Greg Kinnear and Diane Lane) appear poised to challenge the first female president. The eight-episode final season of "House of Cards" will premiere on Netflix on Nov. 2.